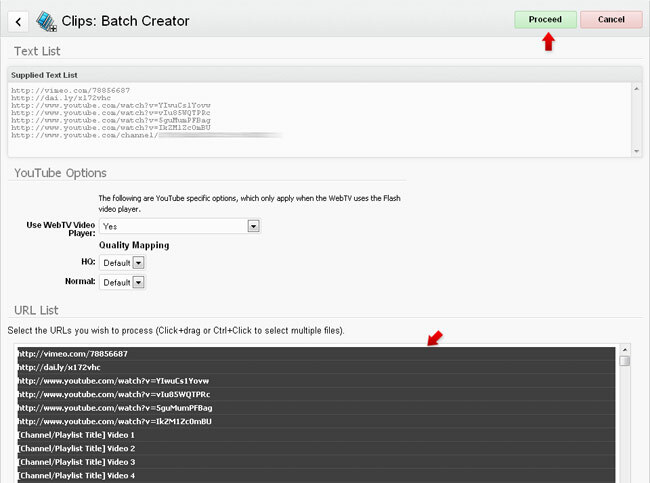 Step-by-step instructions on how to use the BatchCreator extension in WS.WebTV. 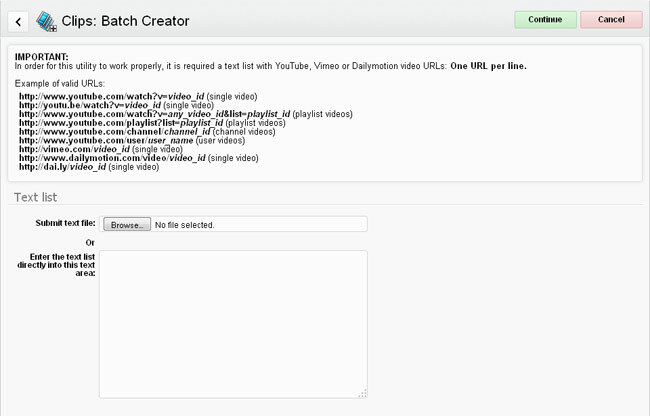 • Your WebTV must have the BatchCreator extension. Go to the Clips page, click on "Utilities..." button and select "BatchCreator". A) Create from video files in Local, FTP or Media server. B) Create from text list with video file URLs (StreamClip extension required). C) Create from list of Youtube, Vimeo or Dailymotion video URLs (WS.WebTV 1.4.2.1+ and EmbedClip extension required). In this mode, the utility will look for (new) video files located in the local movies folder, external FTP or AWS; depending on the video configuration of your WebTV. - If your ar using WS.WebTV Free or Professional and you are storing the video files locally; then upload your files to the uploads/movies folder. - Only applicable on WS.WebTV Professional: If you are storing your video files on an external server or AWS then upload your video file to the corresponding storage server or Amazon S3 account. Just make sure you are uploading to the same FTP or Amazon S3 account configured in the Video section of your WebTV's Configuration. • "<clip_name>": must not contain special characters, only alphanumeric ones (A-Z, a-z, 0-9). • "---": quality name separator (must be three dashes). 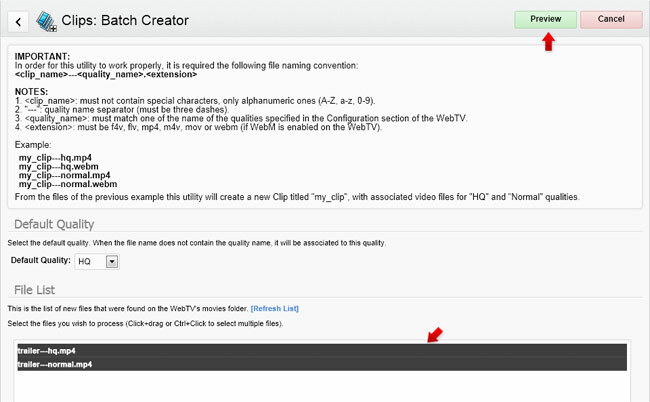 • " <quality_name>": must match the name (label) of any of the WebTV's qualities. • ".<extension>": must be f4v, flv, mp4, m4v, .mov or .webm. Result: From the previous example the BatchCreator will create a new Clip titled "my_clip" (since WS.WebTV 2.4, the resulting title would be "My clip"), with associated video files for "HQ" and "Normal" qualities. Importing images and video thumbnails (sprite) too (WS.WebTV 1.4.2.1+). my_clip---sprite.jpg (will associate the video thumbnails' image file). my_clip---sprite.vtt (will associate the video thumbnails' VTT file). Result: From the previous example the BatchCreator will create a new Clip titled "my_clip" (since WS.WebTV 2.4, the resulting title would be "My clip"), with associated image, video thumbnails and video files for "HQ" and "Normal" qualities. Associating Channels and Categories too (WS.WebTV 1.9+). It is also possible to automatically associate Channels and Categories to the creted Clips, by using the special strings ---cat<id1,id2,id3,...> and ---chn<id1,id2,id3,...> in the video file names. Result: From the previous example the BatchCreator will create a new Clip titled "my_clip" (since WS.WebTV 2.4, the resulting title would be "My clip"), with video files for "HQ" and "Normal" qualities; additionally, it will associate the new Clip with the Categories whose IDs are 1, 2, 3 and 10 and, finally, will include the Clip in the playlist of the Channels with IDs: 3, 4 and 5. Ignoring text at the end of the filenames (WS.WebTV 2.4+). Some times, when files have been generated by automated systems, their names may include an added text before the file extension (a time stamp, for example); this added text may cause troubles for the Batch Creator and you may want to instruct the Batch Creator to ignore it. Result: From the previous example the BatchCreator will ignore the time stamp and will create a new Clip titled "My Clip", with video files for "HQ" and "Normal" qualities; additionally, it will associate the new Clip with the Categories whose IDs are 1, 2, 3 and 10 and, finally, will include the Clip in the playlist of the Channels with IDs: 3, 4 and 5. Appending additional text to the Clip title (WS.WebTV 2.4+). Some times, when files have been generated by automated systems, their names may include an added text before the file extension (a number, for example); you may want to append this text to the Clip title. Result: From the previous example the BatchCreator will ignore the time stamp and will create a new Clip titled "My Clip 1", with video files for "HQ" and "Normal" qualities; additionally, it will associate the new Clip with the Categories whose IDs are 1, 2, 3 and 10 and, finally, will include the Clip in the playlist of the Channels with IDs: 3, 4 and 5. Only new files (files not asociated to any Clip) will appear in the File List. Please, note that you can update the file list by clicking the "Refresh" text link. 2) Select the default quality, the files to be processed, as well as the desired options ...then, click the Preview button. Default Quality: This option allows you to select to the Quality to which will be associated any files which do not contain, as part of their names, the name (label) of a WebTV Quality. File List: Here you can select, individually, the files you wish to process. Options: (Available since WS.WebTV 1.5) In this section you can select some options for the created Clips: activate them, insert them into a Channel, and/or associate them with one or several Categories. 3) If everything is OK, then click on the Proceed button to create the new Clip(s). 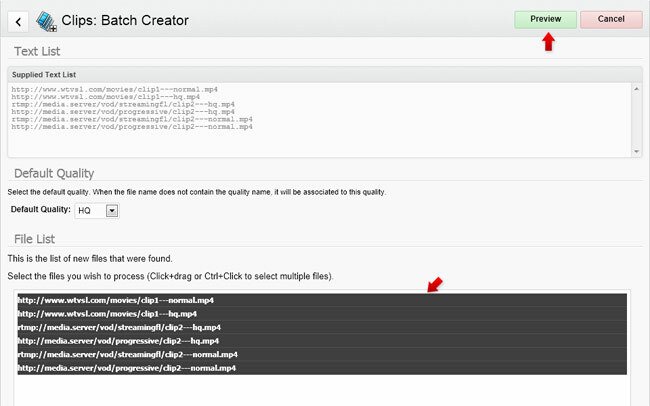 In case there is anything wrong, click the Back button and modify the file names as required. In this mode, the utility will look for (new) video files from a text list. 1) The first thing you have to do is create a text file with the list (or enter the list directly into the corresponding text area) of video file URLs, in one of the supported formats: "Simple" or "JWPlayer RSS". Please, read the explanation provided by the utility and check the supplied examples (click the blue text links in order to see the explanations). NOTE: If you are supplying a JWPlayer RSS file; make sure it is UTF-8 encoded. Options: (Available since WS.WebTV 1.5) In this section you can select some options for the created StreamClips: activate them, insert them into a Channel, and/or associate them with one or several Categories. How to get your Google API Key? Read the tutorial. In this mode, the utility will look for (new) embedded videos from a text list. 1) The first thing you have to do is create a text file with the list (or enter the list directly into the corresponding text area) of YouTube, Vimeo and/or Dailymotion URLs: One URL per line. 2) Select the YouTube options, the URL/Videos to be processed, as well as the desired options ...then, click the Proceed button. YouTube Options: These options will only appear if the list contains YouTube URLs. URL/Video List: Here you can select, individually, the videos you wish to process. Options: (Available since WS.WebTV 1.5) In this section you can select some options for the created EmbedClips: activate them, insert them into a Channel, and/or associate them with one or several Categories. A note regarding the Automatic Category Association (WS.WebTV 2.2.0.3+): If you have set automatic association rules for the Categories, and the functionality is enabled for content creation (Configuration > Settings > General / Categories), those rules will be applied to all created EmbedClips, regardless of the Categories selected in the "Options" secton. Keep in mind that, in the particular case of Vimeo, you will need to include the Vimeo API info into Configuration > General > External APIs, otherwise, the system will not be able to get the categories associated to the videos imported from that website.